Switzerland or France: which country is more expensive? 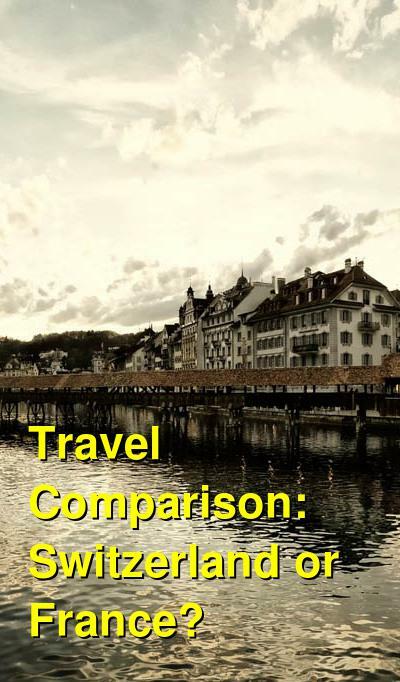 This comparison of travel costs between France and Switzerland examines average prices across multiple categories. Please visit each country's individual budget page for more detailed information. Should you visit Switzerland or France? 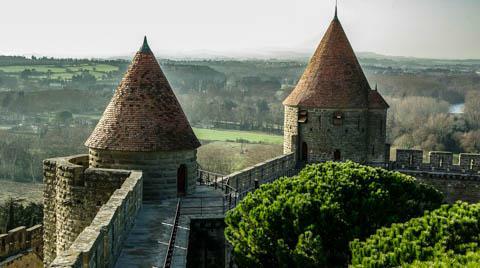 Both France and Switzerland are popular travel destinations in Western Europe and both countries have their own unique culture and cuisine. Each country has a lot to offer visitors, but they are also relatively expensive, particularly for budget travelers who want to keep costs to a minimum. In particular Switzerland is a notoriously high cost place to visit. Some people say Switzerland is one of the most expensive countries to visit in Europe. For many, Switzerland is worth the high price tag. The scenery is dramatic and breathtaking, the mountain towns are charming, and the winter sports are thrilling. But if you're a budget conscious traveler, then France has a lot to offer visitors as well. Although the scenery is not quite as dramatic as Switzerland, it is a bit more diverse in France. For many people, a trip to Paris is a must, but keep in mind that Paris is one of the most expensive places in France, so if you're considering costs, look at the surrounding French countryside as well. When is the best time to visit Switzerland and France? France is a beautiful place to visit during the shoulder seasons of spring and fall. During these times temperatures are pleasant and crowds tend to be less than the peak summer months. The summer season can get crowded with travelers and cruise ship passengers and prices typically peak during these times, although it has become a bit more difficult to get off season discounts in France for accommodation or tours. Even during the cold winter months, many hotels are popular with business travelers or tour groups, which drive up prices. Deals on airline tickets can still be found during these low times. The best time to visit Switzerland really depends on what you hope to do there. The winter months are most popular for skiing and other winter sports. March and April is when most of the ski resorts close for the season, so this is a low season in the area. As the spring progresses, more hiking trails will become accessible and by June most trails are great for hiking. July and August is the summer high season when hiking and biking are most popular. By October the weather is getting cooler but it's still too warm for skiing, so this is a low season. December is popular because of the charming Christmas atmosphere and by late December ski resorts are starting to open up. Why is Switzerland more expensive than France? Almost everything, from food to accommodation is more expensive in Switzerland. Switzerland is on the Swiss Franc, which is a strong currency. Salaries also tend to be a bit higher in Switzerland than France, which can drive up the cost of eating out or other basic services. As a tourist, the activities you might do in Switzerland also tend to be more expensive than in France. Everything from ski resorts to museums and restaurants can come with a hefty price tag. For many, Switzerland is definitely worth the cost, but if you're not prepared to pay for it, you may miss out on a lot of what Switzerland has to offer. What are the most expensive and cheapest cities and regions in Switzerland and France? In France, Paris can be a bit more expensive than the countryside, but the coastal areas are also quite expensive, particularly during peak travel months. In Switzerland, the amount you spend really depends on what activities you're hoping to do. Winter sports are also particularly expensive, so be prepared to pay a premium to stay at a ski resort. It's also hard to see a significant difference in price between smaller towns and larger cities. Prices are slightly less during the low seasons in Switzerland. How you can save money when visiting Switzerland and France? Stay flexible. If you don't like the city you're in, or find better accommodation for a lower price, be willing to change your plans a little. Stay with a local. Lots of locals rent out rooms and this is a fun and affordable way to experience the country. In Switzerland, stock up on food and supplies when you're passing through the border towns. Things in border towns tend to be a bit less expensive. If ever there was a country where it's worth preparing your own meals, it's Switzerland. Restaurant prices can be extravagantly high (although the quality is usually also high). If you want to keep your expenses down, stock up on cheap groceries and plan to make your own meals.